With offices in London and Lancashire, Interform Contract Furniture have been producing high quality furniture for all areas of the Contract Sector for nearly 50 years. Our extensive furniture ranges cover a wide variety of both public and private sector environments. These include schools and university study bedrooms & dormitories, hostels, YMCA’s and nurses homes. We also manufacture furniture for health care premises, hotels, elderly persons homes, housing associations and many other establishments. 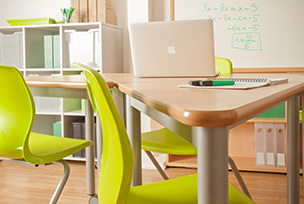 In addition, we produce contract furniture for laboratories, Libraries, classrooms, lockers, music rooms, IT environments, offices, dining and common areas. Interform Contract Furniture manufacture furniture not only to the highest quality and durability standards, but we also produce furniture that is attractive, innovative and long lasting. For peace of mind, all our furniture is backed by up to a 10 year guarantee. Durability and a robust construction are of paramount importance and Interform Contract Furniture's ranges have been tested to BS4875 parts 7 & 8 for strength and stability to test level 5 (severe contract use). The furniture is manufactured at our factory in Nelson, Lancashire to the highest quality standards certified to BS EN ISO 9001:2008. Free of charge contract furniture design and consultancy service is available including the preparation of detailed layout drawings.